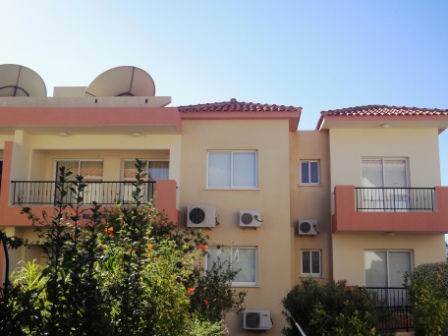 Cyprus Property Blog by Cleo : Price Reduced on Fantastic Apartment in Peyia - NOW SOLD! • 92 sq. m., 2 bath, 2 bdrm apartment - €110,000 EUR - NOW SOLD! Peyia, Paphos, Cyprus - This top floor apartment is located in a quiet area, near the popular village of Peyia, which has a wide variety of amenities including supermarket, shops, restaurants and leisure facilities. The best sandy beaches of the area are a few minutes’ drive away, together with the beautiful Akamas Peninsula known for its stunning scenery. The apartment occupies one corner of the block and has 3 separate balconies, two of which are covered. It features a spacious open plan lounge and dining area, with patio doors leading from the lounge to the largest of the covered balconies which overlooks the mature gardens of the apartments below. In the dining area there is a wall of fitted cupboards, and a doorway from here leads to a large separate kitchen. There is a wealth of cupboard/storage space in this room including tall broom cupboards, and it is well equipped with built-in oven and hob, extractor fan, dishwasher, washing machine and fridge freezer. A doorway on the far side leads to the second covered balcony which overlooks the swimming pool. From the lounge there is a hallway leading to two double size bedrooms with fitted wardrobes, a good size family bathroom, and an additional separate guest toilet. The master bedroom has patio doors leading to it’s own private balcony. This apartment is particularly spacious and has many practical features which make it ideal for residential living, in addition to use as a holiday home. The quality of the finishes is high and it is in excellent condition. Being on the top floor, there is a lift for easy access, and a staircase from the top floor leads to the roof area which has sea views.